Shakespeare’s epic play, Henry V now playing at the Folger Theatre on Capitol Hill, through March 2013. Folger Shakespeare Library and theatre with the United States Capitol in the background. 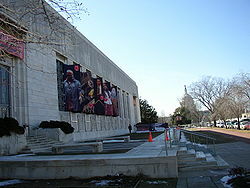 The Folger Shakespeare Library is an independent research library on Capitol Hill in Washington, D.C., in the United States. It has the world’s largest collection of the printed works of William Shakespeare, and is a primary repository for rare materials from the early modern period (1500–1750). The library was established by Henry Clay Folger in association with his wife, Emily Jordan Folger. It opened in 1932, two years after his death. The library offers advanced scholarly programs; national outreach to K–12 classroom teachers on Shakespeare education; and plays, music, poetry, exhibits, lectures, and family programs. It also has several publications and is a leader in methods of preserving rare materials. The library is privately endowed and administered by the Trustees of Amherst College. The library building is listed on the National Register of Historic Places. Standard Oil of New York president, then chairman of the board, Henry Clay Folger, a Phi Beta Kappa graduate of Amherst College, was an avid collector of Shakespeareana. Toward the end of World War I, he and his wife Emily Jordan Folger began searching for a location for his Shakespeare library. They chose a location adjacent to the Library of Congress in Washington, D.C.. The land was then occupied by townhouses, and Folger spent several years buying the separate lots. The site was designated for expansion by the Library of Congress, but in 1928 the Congress passed a resolution allowing its use for Folger’s project. The cornerstone of the library was laid in 1930, but Folger died soon afterward. The bulk of Folger’s fortune was left in trust, with Amherst College as administrator, for the library. Because of the stock market crash of 1929, Folger’s estate was smaller than he had planned, although still substantial. Emily Folger, who had worked with her husband on his collection, supplied the funds to complete the project. The library opened on April 23, 1932 (believed to be Shakespeare’s birthday). Emily Folger remained involved in its administration until shortly before her death in 1936. The main Folger building was designed by architect Paul Philippe Cret. The white marble exterior includes nine street-level bas-reliefs of scenes from Shakespeare’s plays created by the sculptor John Gregory, a statue of Puck by Brenda Putnam as well as many inscriptions personally selected by Henry Folger. The large Art Deco window and door grilles are aluminum. Inside, the building is designed in a Tudor style with oak paneling and plaster ceilings. The two reading rooms (one added in the early 1980s) are reserved for use by scholars who have obtained advance permission. Public spaces include the large exhibition gallery, a gift shop, and the Elizabethan theatre. A second Folger building, the Haskell Center, opened in 2000 across the street from the original building. It houses the library’s education and public programs staffs. The Folger grounds include an Elizabethan garden of plantings from Shakespeare’s plays or that were commonly used in his day.